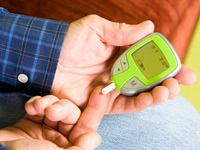 Self monitoring is the use of regular blood testing to understand one’s diabetes control and inform changes to improve one’s control or wider regime. Self monitoring of blood glucose levels has been a hotly disputed issue for a number of years, particularly with regards to people with type 2 diabetes who are not on insulin. For information and advice on what to do if your access to testing supplies is restricted, see our availability of test strips page. The benefits tend to be most pronounced when the patient displays a willingness and commitment to test and has been given enough education on when to test blood glucose levels and interpreting the results to get the most out of the testing. The disadvantages are mainly seen when either the patient lacks motivation to test or does not have sufficient education on how to interpret the results to make sufficient use of home testing equipment.